This project by Alinah Azadeh seems especially relevant in our current climate. Great to see more artists engaging directly with economics. . .
Tuesday June 4th, 11am – 1pm. Free. There is no debt without story. Take a moment to reflect on and engage in a dialogue about debt other than the one you may think is on offer here. Come and hear about this public encounter and digital project, in collaboration with debtors and creditors everywhere and preparing to tour nationally. On May 18th 2013, artist Alinah Azadeh publicly recited and burned £100,134,274 of unpaid financial debt and a whole spectrum of immeasurable debts, contained in the 68 stories she was given, in an act of imaginary absolution, hosted by Blank gallery. These came out of a period of encounters on the streets of Portslade, near Brighton, as well as from many entries received through http://www.burningthebooks.co.uk. Some of these stories are still there and can be browsed for inspiration. They spanned the financial, emotional ,social, ecological, political and psychic – unpaid loans, unrequited love, lost lives, political repression, ecological damage, family feuds, missed opportunities, love and gratittude.. 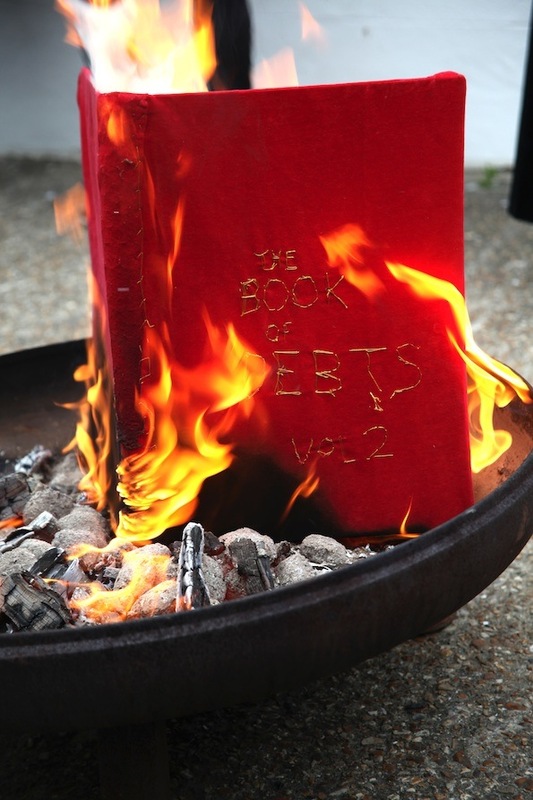 The Book of Debts, Volume 3 is now open to entries online, and Azadeh invites the community of LSE and other invited guests to contribute, question and engage with the project as part of her seminar on June 4th, 11am. She will be reciting some of the texts from the final event as well as giving background and raising questions around the moral confusion that the construct of debt seems to be creating in both personal, social and wider political spheres. Previous: £120,000 research fund open to artists and creatives across all artforms. . .
Next: Confirmed Fierce Festival 2013 artists / projects announced. . . more names to follow. . .